'Puppet Baby' (Carl Boswell, R. 1981). Seedling #69-71. MDB, height 7" (18 cm). 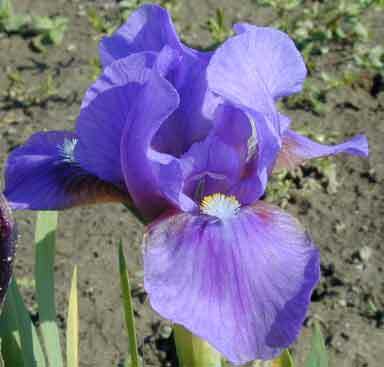 Early bloom, Blue lavender; plum brown hafts. 'Puppet' X ( 'Just So' x 'Rickshaw'). Boswell 1982. Honorable Mention 1985; Award of Merit 1989; Caparne-Welch Medal 1991. From AIS Bulletin #245 April 1982 Introducing PUPPET BABY (Carl Boswell '82) MOB, 7", Sdlg. 69-71: Puppet X (Just So x Rickshaw). A perky little blue-lavender self, with plum-brown hafts on round falls. A reliable, early and long blooming flower in our area. A welcome addition to the MOB class. $7.50. Boswell Iris Garden. jpg 20170510_115846MDB Puppet Baby (2).jpg manage 1 MB 04 Aug 2017 - 19:34 HollyJohnson2017-04-01 MDB Puppet Baby. Photo taken by Holly Johnson at the Minnesota Landscape Arboretum, zone 4b, on 5/10/2017.